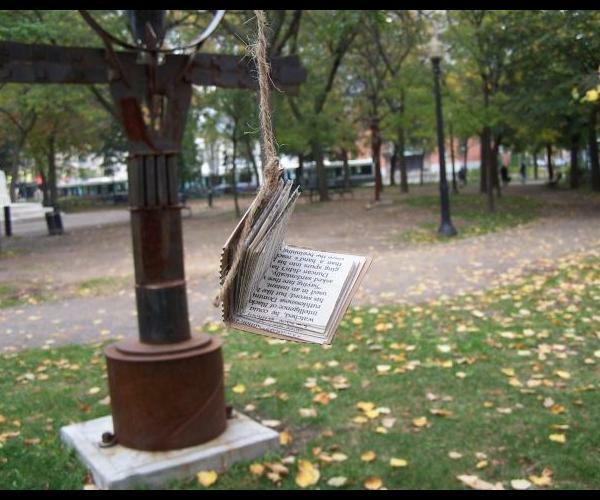 Books hanging from trees. The idea is to ask people in the Atwater Library neighbourhood to tell some stories about the library, about their lives, about any topic that they would like to share. They could even draw pictures, or take photographs or simply recount a story in an interview that could be transcribed. These visual or text-based expressions would then be turned into small books that could be placed around the neighbourhood – in the square, in the front garden, in the library, in the indoor spaces such as shopping complexes or metro stations nearby. It is an opportunity for people who share this neighbourhood to connect with each other, to share something and discover something about the other people who share this geographical space. In a society where interacting with total strangers is frowned upon, sometimes uncomfortable, it is a way to connect through anonymity. It engages the community, while raising the profile of the library outside its walls. “Bookquet.” This idea is something that would hopefully increase the library’s presence in the community through the making and installation of flowers made of old books pages. The idea is to create something out of the ordinary, attention grabbing that sparks people’s curiosity enough that they ask questions. I would imagine having some of the flowers say “Atwater Library” or have a link to a website written, perhaps even detachable leaves with a web address that people could take with them. I also imagine that these flowers could lead in a line from the Library outwards in different directions in the neighbourhood, so that when they are discovered they lead back to the library. Another element of this project would be including the community in the making of them by setting up in a public place and inviting people to take a seat, maybe have a cup of tea, and spend a little bit of time making flowers with me/us. I imagined this outdoors, but given the weather it would be great to find a public indoor space that would allow us to set up a flower-making station. I like the idea of collecting old books that would otherwise be recycled and turned into paper pulp and transforming them to have a new life. One such way would be to make sculptures using these books and then to paint them entirely white. This would make them a blank canvas, a medium for people in the neighbourhood to express something. Again, it’s about inviting the community take part in the project. It could be that a small team of people cover them in quotes collected from a range interviews, or that someone artistic designs something that can be painted onto the sculpture, or it could be something entirely different, with less preparation and control. They could be a space where people could contribute spontaneously by leaving them blank and having a sign that invites passerby’s to graffiti on them, or write something. This would allow some anonymity, and with that the contribution of a different demographic, perhaps the people we would not otherwise find to participate or interview. A wall made of books. This is yet another chance for people to express themselves or share stories. It could also be covered in quotations but ideally I would want it to be a participatory space. I imagine it primarily as a way to engage young people by making it a blank space that they can paint, draw, write poetry, graffiti. There is something transgressive about treating books in this way. To paint them or ‘destroy’ them in such a way that they would no longer be usable as books I think has a certain appeal to an age range who has spent the majority of their life in educational institutions that narrowly defines what is ‘appropriate’ treatment for books (and the learning experience that is associated). The first three photos below are from my initial presentation, the last two are of work made by Mike Stilkey, the artist that inspired ‘A wall made of books’.